As of December 2015, the Nature Conservancy of Canada (NCC) has joined a group of reputable conservation organizations around the globe like the Jane Goodall Institute, the National Audubon Society, The Nature Conservancy (U.S.), the Wildlife Conservation Society and the World Wildlife Fund: the Conservation Measures Partnership (CMP). The CMP is a collective of conservation organizations that seek better ways to design, manage and measure the impacts of their conservation actions. By becoming a member of the CMP, NCC will contribute to the improvement of conservation practices around the world by sharing our expertise and experience with the other members of the CMP. Spearheaded by NCC’s National Conservation Business Unit, this was very much a grassroots initiative more than three years in the making. Staff from across the organization got together to brainstorm on how we could improve the way we strategically plan our work. 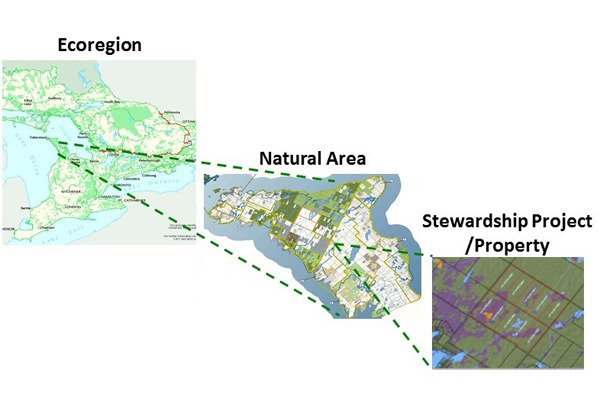 NCC has had a structured conservation planning framework nationally since 2007, based on a hierarchy of planning scales: ecoregions, natural areas and properties. But since 2007 the size of our team and the scale and ambitiousness of our operations had grown considerably; we had become a different organization. There was a need to make some major modifications to the way we worked — from giving our Regional staff more autonomy, to updating our planning methods and tools. This was a big transformation for us and involved months of brainstorming sessions, workshops, training sessions and figuring out all of the many ways this was going to have on our organization. And it is not over yet…We are still developing internal tools that allow us to ensure that our conservation plans are developed efficiently and inform our conservation work on the ground. We want those plans to be living documents and be real drivers of our day-to-day work through an adaptive management cycle. As you may guess, this can have very significant impacts on the way we work as an organization. We are now starting to collect some payoff, as NCC’s experience in adopting the Open Standards is being recognized by our partners abroad. So what’s the big deal with the CMP anyways? 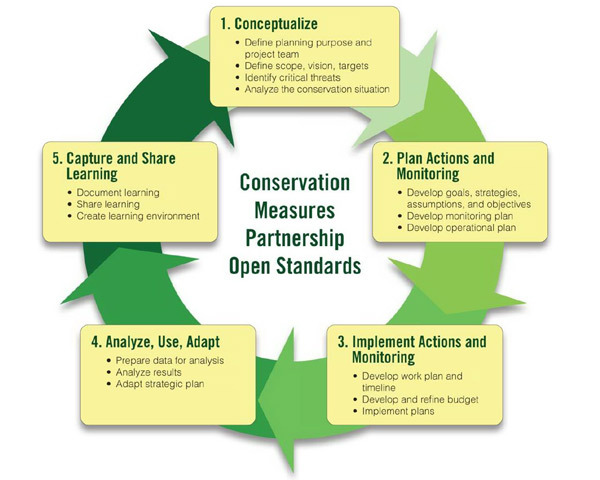 The Conservation Measures Partnership (CMP) is a partnership of conservation organizations that seek better ways to design, manage and measure the impacts of their conservation actions. As we all know, conservation organizations work with limited resources compared to the urgency, scale and complexity of environmental issues. 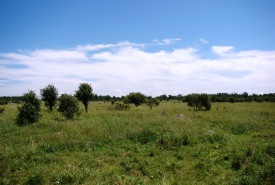 Best practices and tools that are developed by the CMP, like the Open Standards for the Practice of Conservation, the Miradi software and the cloud-based Miradi Share help conservation organizations continuously improve their work and learn from each other; hence better utilizing their limited resources. What does this mean for NCC? By adopting the Open Standards for the Practice of Conservation and becoming a member of the CMP, we will be able to increase the effectiveness of our conservation actions and help answer this essential question: are we doing the right things and are they working? We will then continue doing what works best with confidence and modify our approach when results are not what we had hoped for. In other words, it will help us do more with the funds that are provided to us by our generous donors. What is NCC going to do on the CMP? As a CMP member, NCC will contribute to improvements in the way conservation organizations conduct their work and show their effectiveness at saving the species and landscapes that we all care about. We will be sharing lessons learned and best practices with other organizations in areas such as climate change adaptation, selection of lands with the highest ecological value and improving the management of conservation projects and programs. One example of such collaboration is the relationship that NCC has built with Bush Heritage Australia, an organization with a similar mission to ours. Even if we are literally located on different faces of the Earth, the CMP has brought us closer to each other. Our staff have been collaborating at various levels on areas such as conservation planning and management of conservation projects and fundraising. 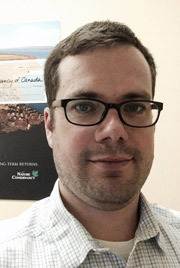 Charles Latrémouille is the Natural Area conservation planning manager with the Nature Conservancy of Canada. Read more about Charles Latrémouille.